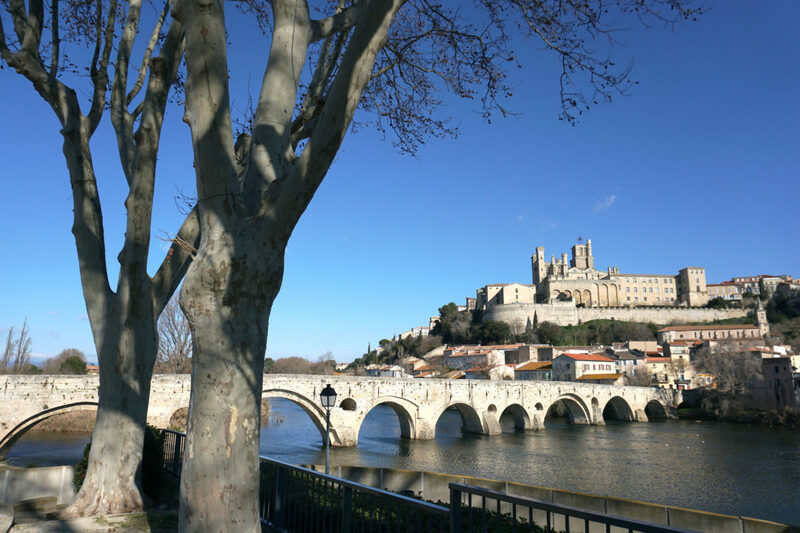 I’ve seen this view of Beziers many times on postcards and always thought it would make a fine painting subject. When we finally found exactly where the view was from, we climbed to a higher terrace and included the wintry plain trees which I think add to the composition. We were on an exploratory walk so I had no equipment with me so this tutorial is worked up from photographs I took at the venue. I recommend taking lots of slightly different angles of the scene you’re looking at – the first one isn’t always the best. Once I settled on the ‘best’ view I really loosely blocked in the main shapes in 2B pencil ( I’ve used red to show you where I meant). I used a 52 x 38 cm (half imperial) 300gsm watercolour paper. With hindsight 420gsm would have been better as it all started to buckle quite badly. 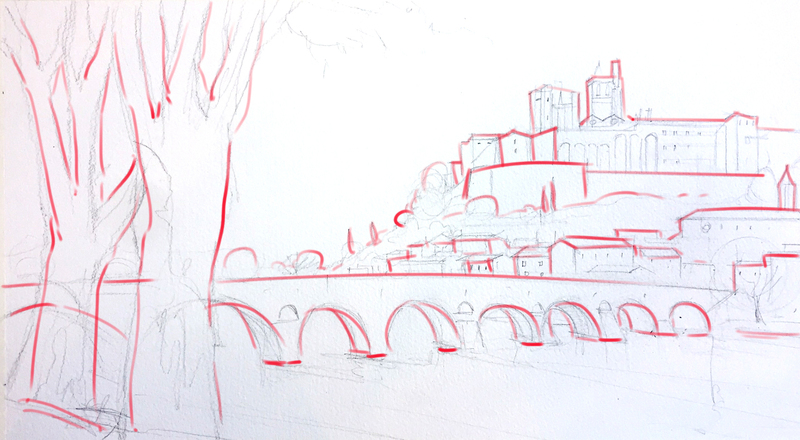 I recommend starting your sketch with the highest point and working down otherwise you may not have enough room to fit the Cathedral towers in – I’ve done it before. When you’re happy with the overall composition and scale of everything, add some more details ready for some initial washes of colour. I perhaps should have wet the paper with clean water to discourage buckling later but I didn’t. I mixed up a large amount of Cerulean blue with a touch of Tropical Pthalo blue to give the sky a touch of winter in the south of France. You could wet the sky area with clear water first, carefully going around the buildings, before adding washes of sky colour. The blue will generally flow more easily into the dampened areas. Don’t forget to add a little water to the mix as you come down the sky to give it a natural fade. Once dry – wash mixes of Naples yellow, Yellow ochre and Burnt sienna onto the remaining area. This helps set the overall tones. 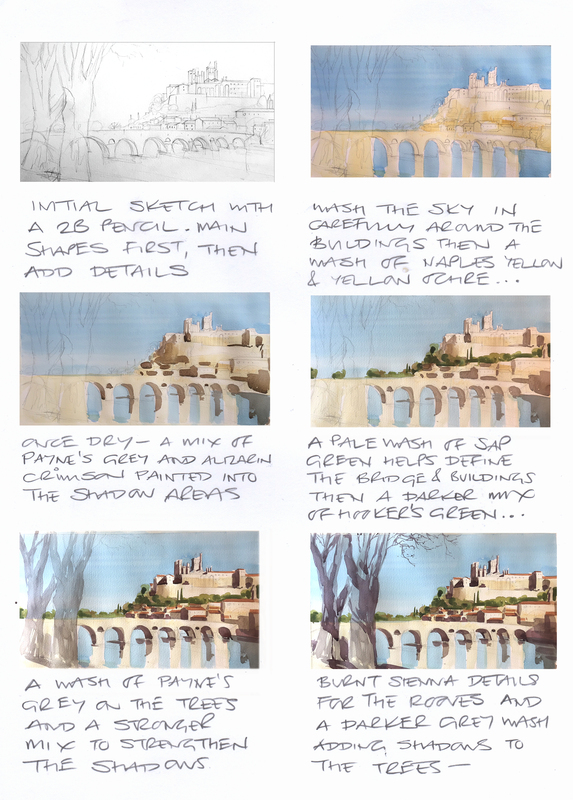 Here’s the stages 1 – 6 of the tutorial below. I’ve done my best to indicate what was happening step by step: basically, starting in the background and intensifying the colour as you come nearer. To print out the tutorial, save to your desktop, open and print. Once I got to this point, I stood back and reassessed the weight of overall tone and decided that I needed to increase the contrast. 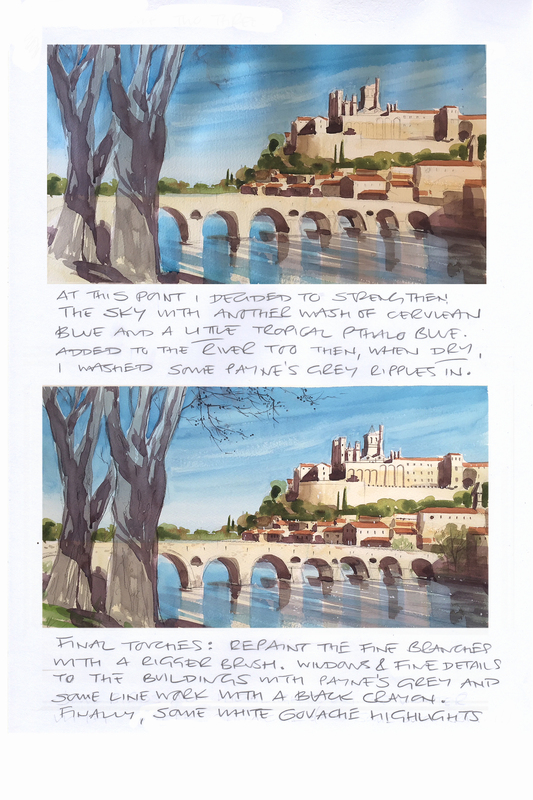 I added a stronger wash over the sky which meant that I needed to redo the branches, and increased the drama in the river too – details below. Sorry about the dark waves in the sky – just my badly lit photography. Quite pleased with the overall result and looking forward to painting the scene en plein air when the weather warms up a bit. Next stop, the old port of Sete..